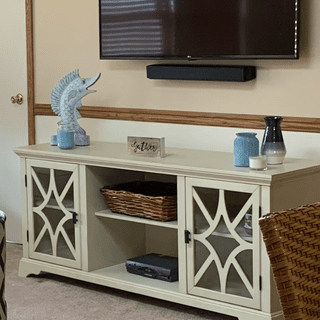 L: 66" x W: 19" x H: 29.3"
Kaden 66" TV Console Reminiscent of traditional cabinetry, the Kaden TV console combines vintage decorative details with modern media storage. Wood-framed glass doors feature diamond starburst wood overlays, and scalloped bracket feet and antique white cherry veneers add to the classic look. Plus, the sturdy hardwood frame and ample cable cutouts will handle the weight of your TV and A/V equipment and hide the tangle of cords. Reminiscent of traditional cabinetry, the Kaden TV console combines vintage decorative details with modern media storage. Wood-framed glass doors feature diamond starburst wood overlays, and scalloped bracket feet and antique white cherry veneers add to the classic look. Plus, the sturdy hardwood frame and ample cable cutouts will handle the weight of your TV and A/V equipment and hide the tangle of cords. We saw this online and decided to see it in store before ordering. I it just perfect if you are looking for something a bit unique, beachy or to just really kick up your room a notch. It is very long and full of amazing storage. Each different slot has and exit point for the cords in back and the bottom shelves also have it on the bottom of the shelf! It is sturdy and heavy and the color is really amazing. In addition, Raymour and Flannigan was quick, efficient and did an excellent job of bringing this up three flights of stairs. A great experience and a great piece of furniture. We just purchased this piece last week. We love the way it looks, and that the shelves are somewhat adjustable. The only complaint I have is that they cord holes are towards the top.. I feel that the cords shouldn't have to go up and then out, because then you can see the cords. We went to the store to see this in person after seeing it in a sale flyer. It was everything we wanted - and more! The piece is heavy and sturdy, and holds a lot of electronics as well as other storage! Absolutely perfect, practical and beautiful as well! very happy with this purchase . Quality and color are great. Very steady and is real wood. Looks perfect on my family room. Good storage space also. We were looking for something to replace our big clunky dark oak entertainment center to brighten our room and open up the space. We found the Kaden the perfect piece to do this. It is solid construction and makes our house look more modern and contemporary. There is plenty of storage and the glass doors are secure. Highly recommended it. Beautiful piece. Well-made. The antique white finish brightens up the room nicely and the shelves/glass doors are perfect for display items. This is a beautiful piece that is exactly as shown and described. Order and delivery was quick and seamless! I found this online and went to see it in store, it is even prettier in person! The color is more ivory than it seems online, which was great for us, I was actually concerned that it may be too white but it's perfect. It is a beautiful addition to our tv room, we replaced a darker stand with this and it really brightened the room up. It can lend itself to either a country or beachy theme, I feel. My only suggestion to make this piece better would be to move the cord holes to the bottom so the wires aren't seen going up and out. Really stands out against the light color (the black wires). Otherwise, great quality and very beautiful!! We went to the store and found this piece of furniture. We really love it. It fits great in the area that we placed it. The color and the size fits perfectly. It s a nice piece of furniture. Where you place your equipment is really good. It is also great for some storage. The console arrived about a week ago the delivery service was great. They actually arrived an hour earlier than expected, which I was happy about. The console is the color I wanted and seems very sturdy and well-made. The only thing missing was a matching piece in an accent table or small bookcase. I was also happy with the price I paid and the ease of purchasing online. We had the most fabulous sales consultant and the furniture is lovely. We love R&F. They made it possible for us to have a beautiful home!!!! Great quality quick delivery fits my 65 in curved fine, the drawers on the inside are sturdy. this product is gorgeous. The color is as shown and very well made. The price is great. I would recommend this console to anyone looking for quality and beauty for a good price. Do you have matching bookshelves or curio cabinets with glass doors? BEST ANSWER: While there is not currently a matching glass front bookshelf or curio cabinet to the Kaden console, please contact our Online Sales at 866-383-4484, option 3 for assistance with an alternative selection. Is "white glove delivery" included in the price or is that an extra charge? what size tv is on display in the picture ? I can only tell you that I have a 48” WIDE (horizontal measurement not diagonal) TV on the console and there is 9” remaining at each end. It looks balanced not overbearing. I submitted a photo that may show up in the “Social” tab on the home page. Under the name Nanette. Best regards. I have a 60" TV on my console and it fits perfectly with room on both sides. Hope this answers your question. BEST ANSWER: The shelves are adjustable. BEST ANSWER: Hello Corinne, yes wire management cutouts are already pre-drilled. I bought this console recently and I love it, but the 6 cut outs for the cords to go through are not hollow--you can't actually put the cords through it. It's as if there was a piece that was not removed. I'm wondering what I should do about this? I uploaded a photo above in the "Product Reviews" section for reference. Is this displayed in a store in Manhattan? BEST ANSWER: The Kaden 66" TV Console is displayed in Manhattan. For assistance with specific locations, please contact Online Sales at 866-383-4484, option 3. What are the measurements of the middle shelves? BEST ANSWER: The outside, enclosed areas measure 18 1/2" L X 16" W X 22" H. The center opening measures 23" L X 16" W X 22" H. The shelves are adjustable, but have an approximate 11/1/2" opening space. Is the color a creamy white or a grey white? BEST ANSWER: The color is a creamy, (antique) white. Is this on display in any Rochester stores? BEST ANSWER: The Kaden Console is on display at the Rochester showrooms. BEST ANSWER: While there is not a sample of the Kaden Console, we would be happy to find a location nearest to you where the console is displayed. For assistance, please contact Online Sales at 866-383-4484. option 3.